The lipid hypothesis led to the development of cholesterol lowering drugs and cholesterol lowering diets as a means to try and reduce the incidence of coronary heart disease (CHD). The efficacy of cholesterol lowering diets (low SFA, high PUFA, low dietary cholesterol) were tested in several clinical trials, many of which took place approximately 50 years ago. Five main meta-analyses have pooled the results of these clinical trials, but have come to different conclusions (see table below). All the meta-analyses, except Ramsden, et al (n-6), found a significant (P < 0.05) or near significant (P < 0.10) reduction in CHD events in the order of approximately 20%. Only Mozaffarian, et al and Ramsden, et al (n-6+3) found a significant or near significant reduction in CHD mortality. And only Skeaff & Miller found a significant reduction in total mortality, with the hazard ratios in other meta-analyses being very close to 1.0 on average. The different results between the meta-analyses is partially due to differences in the trials each of them included. There are nine trials that have been included in at least two of the meta-analyses and only five of the nine trials were included by all of them. 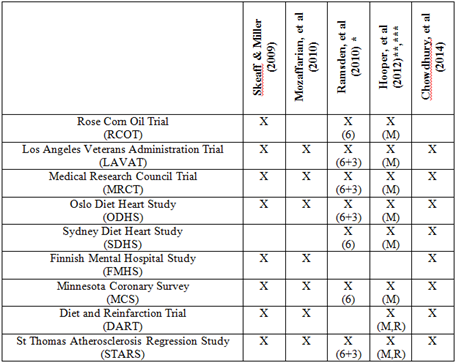 In addition Ramsden, et al and Hooper, et al performed separate analyses based on their categorisation of the trials. The trials, their inclusion in meta-analyses and how they are categorised in Ramsden, et al and Hooper, et al is shown in the table below. It seems that the figures for STARS should be 3/27 vs. 10/28. Do you know how they arrived at 8/27 vs. 20/28 for CV events? For MRC, heart attacks should be 40/199 vs. 39/194, not 39/199 vs. 40/194. "The fiber content was similar in both groups as was the cholesterol content, being 88 rag/1000 Kcal in both groups except for 4 patients of group I who preferred butter over saturated margarines"
I agree, Hooper has errors, and so do the others. I'll put up a post on this shortly. Their figures for STARS seems to come from CVD events (including surgery) + 'requiring increased anti-anginal treatment' (5 vs. 10; see page 567 http://www.ncbi.nlm.nih.gov/pubmed/1347091). Took me a while to figure that one out. Their figures for STARS seems to come from CVD events (including surgery) + 'requiring increased anti-anginal treatment' (5 vs. 10; see page 567 http://www.ncbi.nlm.nih.gov/pubmed/1347091). Took me a while to figure that one out." I would have never figured that out! I really don't understand how those are cardiovascular events. I suppose one could argue that 'requiring increased anti-angina treatment' is indicative of events of angina, which can be considered a CHD event, but not a major CHD event. I don't really like it either, and non-major events as well, because just like using surgery as a CHD event, it may be influenced by insufficient participant and/or researcher blinding. When I was trying to understand some of the odd figures the meta-analyses used, I mainly focused on what numbers (or combinations of numbers) made sense.